Easy-to-make beignets that are deep fried so the outside is golden brown and the inside is light-as-air and fluffy. Served piping hot dusted with a thick layer of powdered sugar. An irresistible French doughnut that is a New Orleans specialty. In the bowl of a stand mixer, using the paddle attachment, combine 2½ cups flour, buttermilk powder, sugar, yeast, and salt. Add water and eggs to flour mixture. Blend at low speed until moistened. Beat 3 minutes at medium speed. Switch to the dough hook and mix in the remaining flour a little at a time, to make a soft dough, add more or less flour as needed. Knead the dough for 5 minutes until smooth and elastic. Place dough in lightly oiled bowl and turn to grease top. Cover; let rise in warm place until double about 30 minutes. Add oil to a deep fryer or large pot until it is 2 inches deep. Heat oil to 360°F. Punch down dough. On a floured surface, roll the dough into an 18 x 12-inch rectangle. Use a pizza cutter to cut the dough in six rows, each 3 x 12-inches. Cut each row into four 3-inch squares. Carefully drop 3 beignets in oil* and fry until puffed and golden brown, about 3 minutes, flipping frequently. Repeat with remaining dough. *When you’re deep frying, it’s especially important that your oil is hot enough before you add the dough. 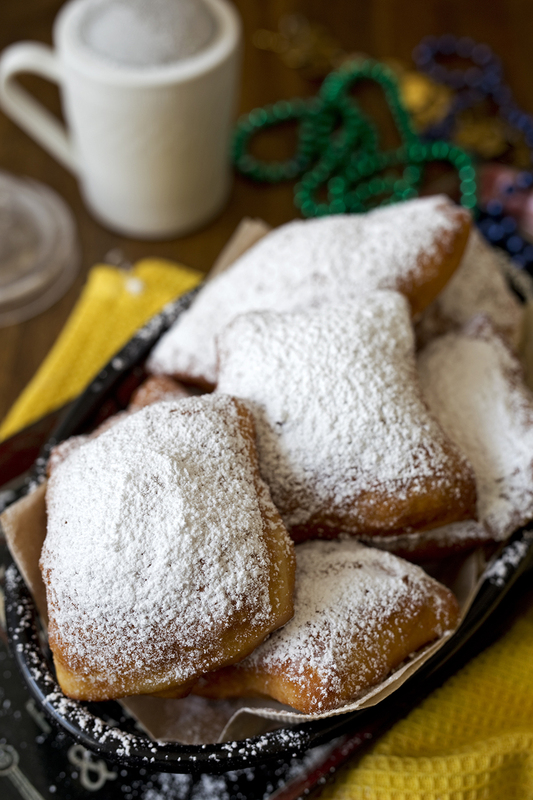 That helps keep the beignets from absorbing the oil and keeps them light and fluffy. What is buttermilk powder? My grocer hasn’t heard of it. It’s dried buttermilk. Google it to see if there’s a source you can purchase it from, or find recommended substitutions. What about a recipe for Fastknaghts? Binges seem to be the closest to what I have. I’m not sure what a Fastknaghts doughnut is. I did a google search and couldn’t find anything, so am not able to suggest a recipe. I hope you enjoy the Beignets!